There are over 18,000 acres of state forests open to the public within 15 miles of the village of Alfred. This land is available for hunting, hiking, Nordic skiing* (cross-country) fishing, wildlife viewing, nature walks and even horseback riding*. Their is also Public Access for many streams and rivers that allow access for fishing. Click here for Public Access Fishing Maps. Click Here for your printable map of Allegany County Public Lands in PDF format. Special thanks to our friends at the Allegany County Office of Tourism & Culture for this map. 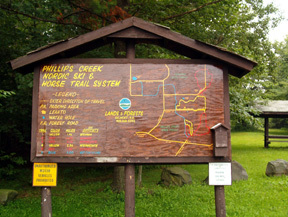 *Phillips Creek State Forest offers a marked and mapped trail system for Hiking, Nordic Skiing and Equestrian Trails (horseback riding). The entrance to the park is only 10 miles from downtown Alfred on Rte 244. In addition to the easily recognized signs to the right that mark the major entrances to our local public lands the signs below are important to take note of as well. These signs mark the roadside boundaries of our state forests. This is a Posted sign. This should be relatively easy to understand but sometimes folks need a little additional information. Landowners that have taken the time to post their land have done so to communicate they expressly forbid any form of trespass for any reason. This example shows the Ask sticker affixed at the bottom right corner. Last, but certainly not least, these sign remind us to take all litter and trash with us when we leave. Please help us to keep our forests clean.